As I mentioned in my ‘Hello New Kitchen’ post two days ago, a neighbor brought us two freshly caught Arctic Char on the day we moved into our new house. Arctic Char, for those unfamiliar with them, are a fish native to these parts and are somewhat like Salmon. I had to fillet our gifts right away, and had no time to cook them immediately (due to the demands of unpacking and so forth), but in a future post I will show you some whole fish and the general method of preparing them for the kitchen. First, chop enough thyme so that you have about 2 tablespoons of leaves and reserve a couple of sprigs for garnishing, if desired. 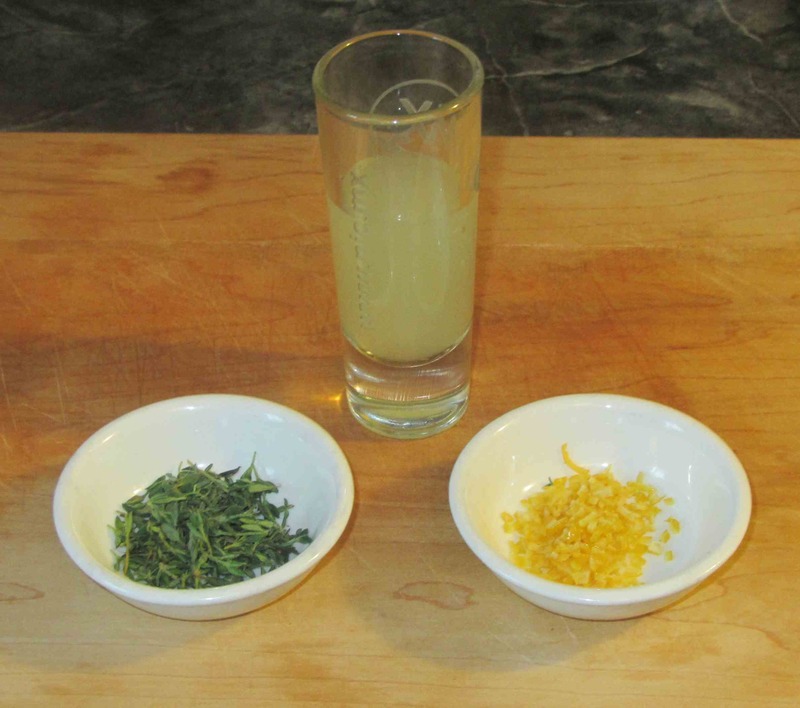 Next, remove and chop enough zest from the lemon so that you have a scant tablespoon, and then juice the lemon into a small bowl. You will need 4 or 5 tablespoons in all so, if your lemon is very small, you may need to supplement with another lemon or some bottled juice. Salt and pepper your fillets, liberally salting the skin side and rubbing it in well. 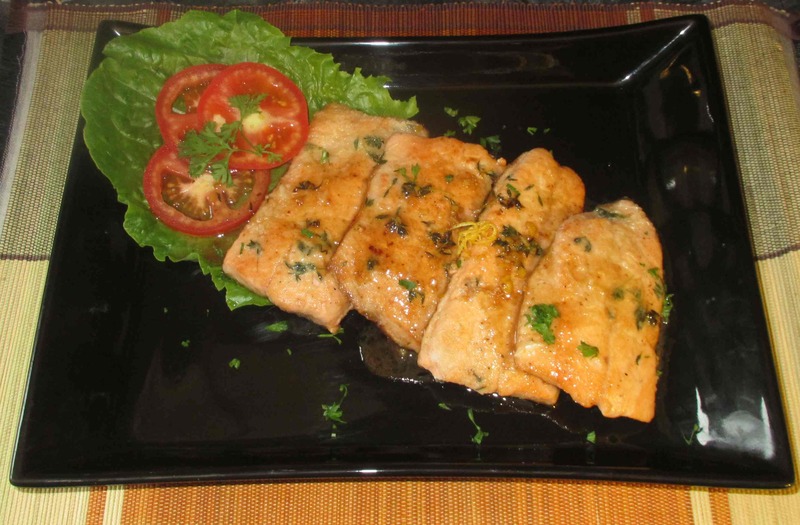 Blend the olive oil with a tablespoon of the lemon juice and one tablespoon of the thyme. 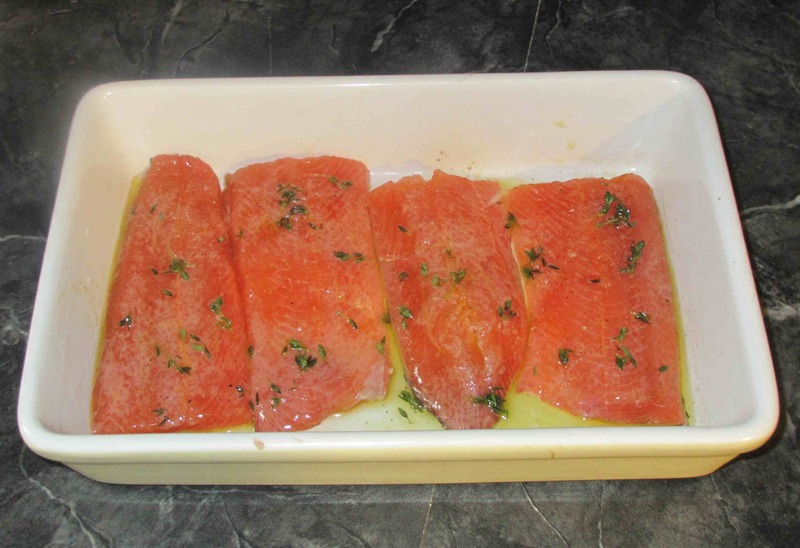 Pour this over the fillets and leave to marinate for 30 – 60 minutes. 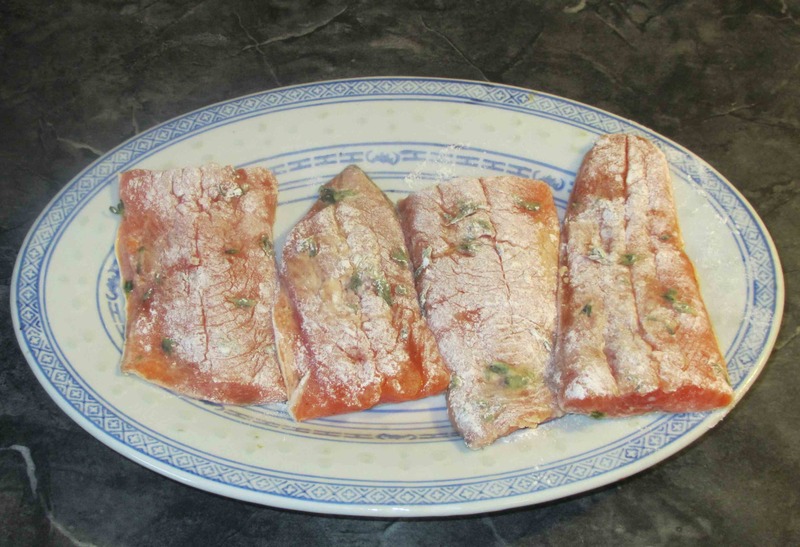 When you are ready to cook, drain the marinade from the fillets, blot them dry and then coat them with flour in a small dish and shake off any excess. Heat a large pan over medium heat and add about half the butter. 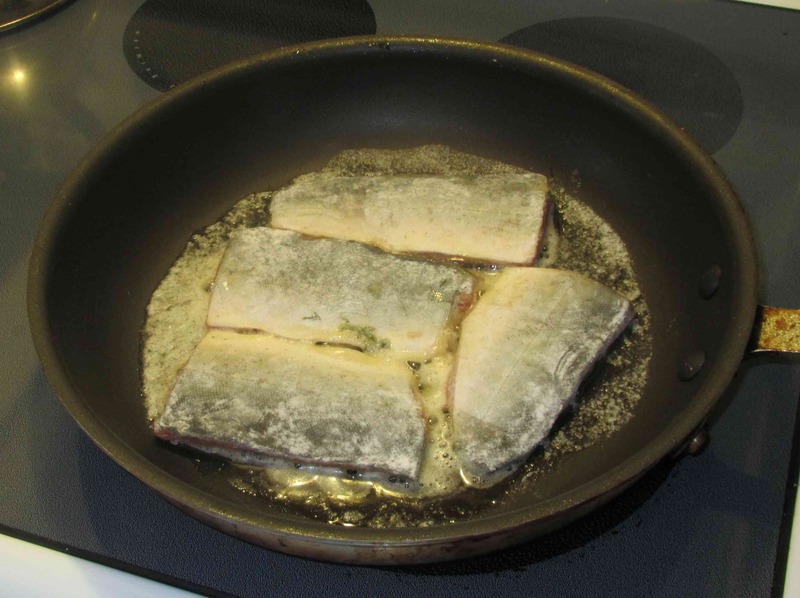 When it is melted and just beginning to foam, add the fillets, skin side up, and fry briefly for about a minute or two until the flour coating is just crisping up and turning golden. Turn the fillets and cook for five minutes or so until the fish is cooked all the way through and the skin is nicely crisp. Remove to a warmed platter and reserve. Quickly rinse out the pan (deglazing just won’t work nicely here) and put it back on the heat. Add the rest of the butter and when it starts to foam, add the lemon zest and the remaining thyme. 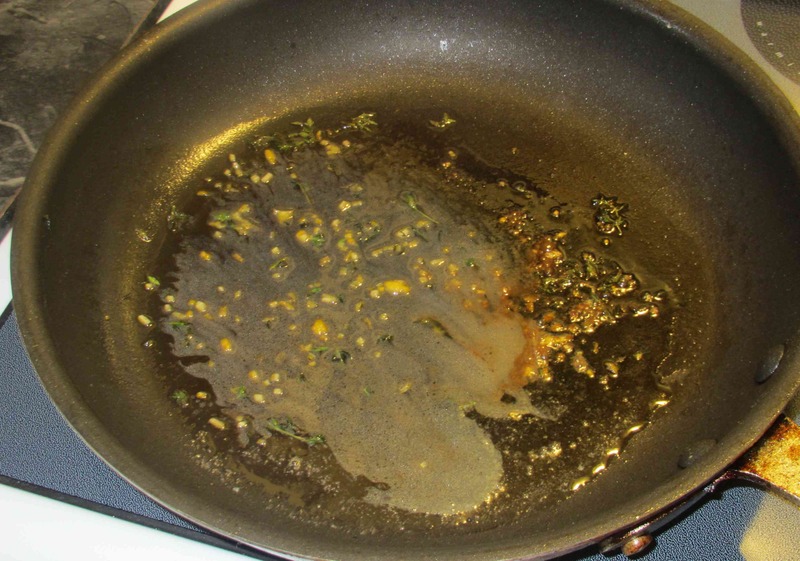 Stir over moderate heat until the butter and lemon starts to brown and thicken. Pour this sauce over the fillets and serve. 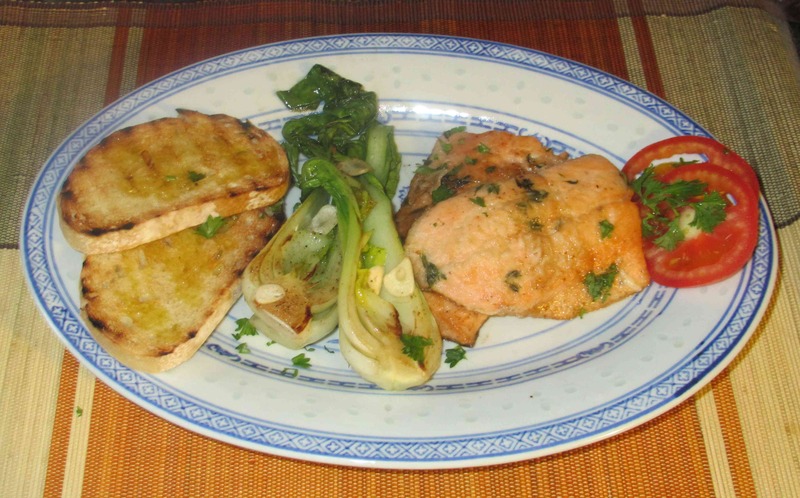 I served the Char with some miniature Bok Choy flash fried with a little garlic and, instead of potatoes or rice, I just pan-grilled up some crusty bread and put the slices on the side drizzled with a little extra virgin olive oil. BTW , this looks very attractive. But I would add more bok choy! I look forward to seeing your whole fish! Looks delicious. It looks remarkably like salmon. I expect it tasted delightful. Char is always terrific as long as it is relatively fresh. It is often served in hotels I visit when travelling to small communities around the North. Another good reason to return to Canada. Yes… Char is related to Salmon. It is very like west coast varieties and I like it much better than Atlantic Salmon. Thanks for your reply. Will have to give it a try. I would love to come and eat in your home for a week – you always have something to interesting and scrumptious on the menu. This recipe looks like another winner, but I am so glad o hear that sometimes you have Kraft Dinner! 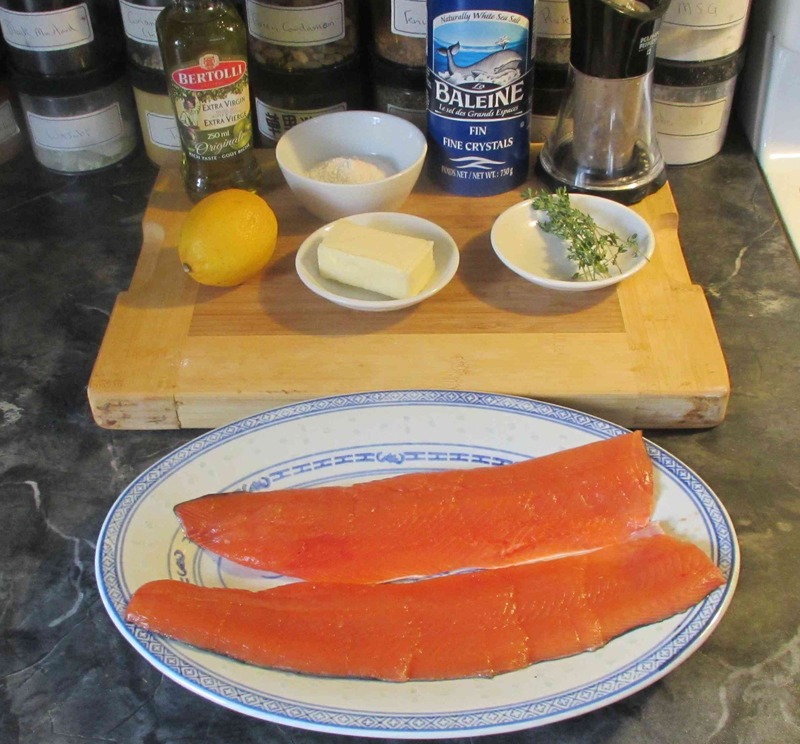 I never would have thought to use thyme for arctic char. That’s an interesting twist. Although i think I agree with you, I’d probably prefer dill. The rest of the recipe sounds really good, though. Bet that given the freshness of the char, it was a great dish. Great, quality fresh fish only needs light handed preparation. I steam fish fillets with abit of oil, a jot of soy sauce with sliced onions and smashed ginger root.